St Johnstone manager Steve Lomas has urged the club to do all they can to keep Murray Davidson at McDiarmid Park. The midfielder impressed for Saints in Monday's 3-1 victory against Hibernian at Easter Road, setting up one of the Perth side's goals. "I'd love the chairman to go and break the bank for him because he is a fantastic player," said Lomas. "We came here with a plan and it worked to perfection and that's all credit to the boys for executing it." Rowan Vine got St Johnstone off to a brilliant first-half start with his fifth and sixth goals of the season. Steven MacLean could have made it 3-0 before the break but saw his penalty saved by Hibs keeper Ben Williams. And Davidson then proved his worth by carving open the home side's defence with a terrific pass to set up Patrick Cregg's goal before Leigh Griffiths netted a late consolation. "I thought there were some good goals and if it had been four or five, Hibs couldn't have complained," Lomas added. Davidson, 24, has not ruled out staying in Perth but admits he is considering other offers for next season. 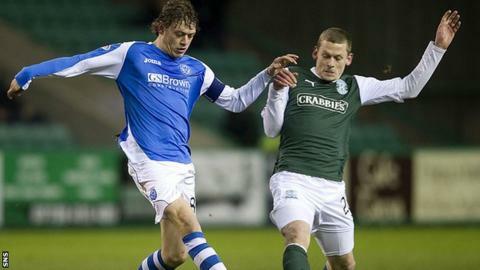 "While I'm at St Johnstone I'll always give 100%," the midfielder told BBC Scotland. "They were kind enough to offer me a contract and that got turned down, but while I'm still at the club you never know. "It's no secret I'm out of contract [at the end of the season] but I'm always grateful to what I've got on the table and St Johnstone are one of the clubs that have put an offer on the table. "We're in the middle of talking to a few clubs, I won't deny that. "My focus is with St Johnstone and when I get the call from my agent saying that we're sort of closer I'll take it from there. "But I'm in no rush and there's still three months of the season. "It's up to me to keep my performance at a level I'm happy with or else I won't have any options!"